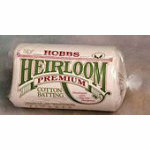 Batting > Batting Heirloom 8020 King 120"x120"
Batting Heirloom 8020 King 120"x120"
80 Premium UnBleached Cotton and 20 Polyester. Created at the request of Harriet Hardgrave to meet the needs of quilters Lightly needle punched and lightly resin bonded resulting in a higher loft for cotton batting without a heavy batting. Approximate loft: 18". Can be quilted by hand or machine up to 4 apart. Washable. 35 shrinkage. King Size 120"x120". Billable transportation charges for freight intensive items will be the greater of the dimensional weight compared to the actual weight. In addition to transportation charges, freight carriers may assess an additional oversize charge per package.